As photographers we come across many areas that touch our hearts. It seems funny to me that it may be a smell, a feeling, an experience or simply, the light that calls us to return over and over again. I’m certain that as we meander the highway of life, we find that our heart attaches to some locations that we journey to. I have always had a hunger to travel and be amongst the most beautiful locations in the world. 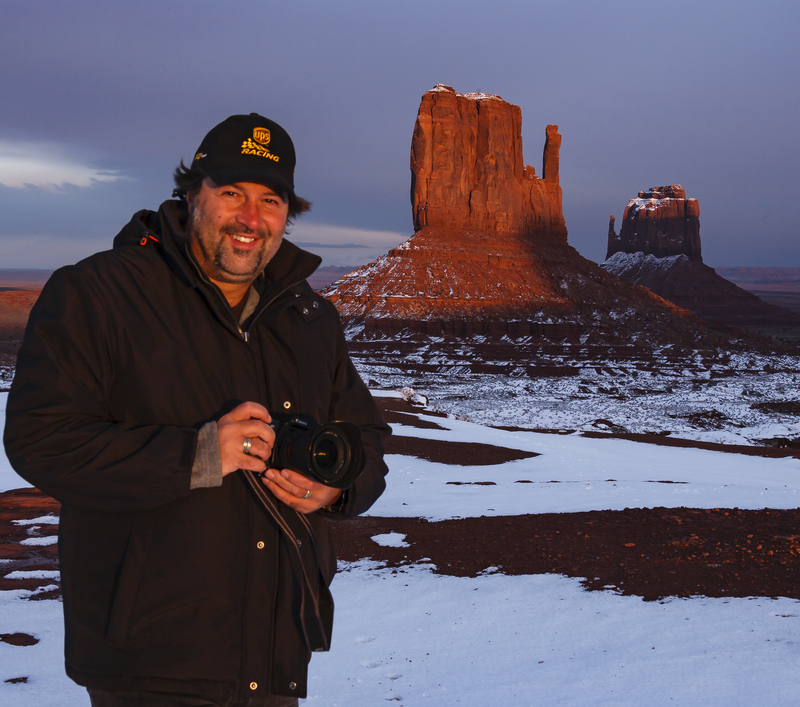 I was drawn to the beauty of Monument Valley in the early 1980’s when I saw images from the Muench family. I knew that I needed to go out to Arizona from my home on Long Island, New York. That decision changed my life. I would eventually leave the comforts of the area where I grew up, where my photography business flourished, where I flew my hot air balloon, where my friends and family lived. These changes were all because of my love for Monument Valley. 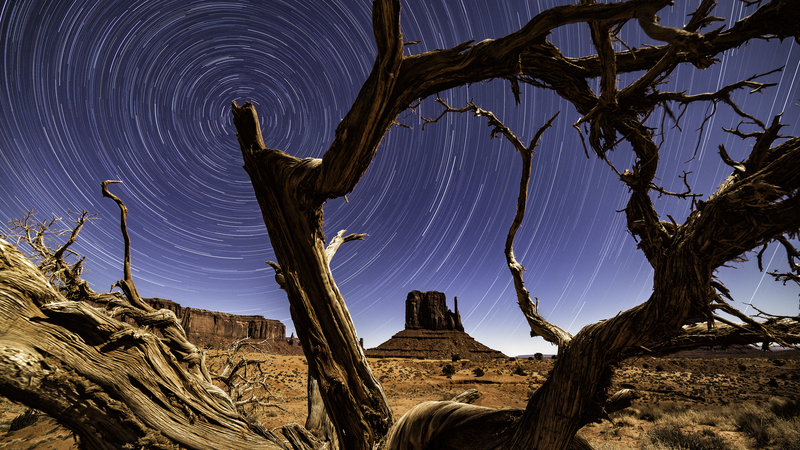 One of the wonderful things about the journey to Monument Valley is that there is no bad time to go see it. Weather and seasons make that statement a reality. 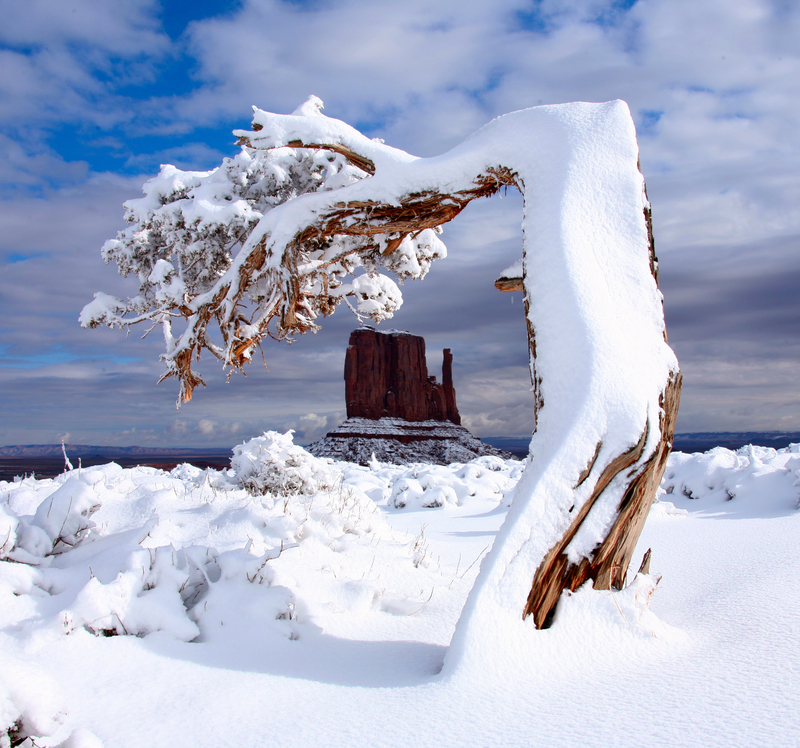 Winter, Spring, Summer and Fall provide us with unique views into the face of the southwest. This is certainly true of Monument Valley. Living just 6 hours away allows me to hit the road on a whim. When a blizzard is in the forecast for the Four Corners region (Az., New Mexico, Colorado and Utah), I head up to MV. I tend to stay away during the very busy summer months, if I can. 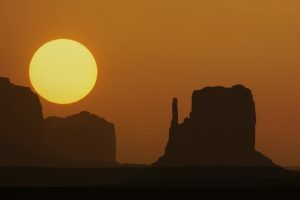 It seems that I cannot spend too much time on the Arizona/Utah border where Monument Valley lies. My trips tend to last between 4-6 days, since weather is such a big part of this vast landscape. I do enjoy the wintertime mostly as crowds are gone and with the low arch of the sun during these months, I can almost photograph all day there. It is not uncommon to have clouds for the dramatic depth that they add with the shadows and mixed sunshine. A bit of rain or snow can add a lot of character and mood, as does nighttime. For hours before or after closing, you will be required to hire a Navajo guide to bring you into the (residential) park to capture another dimension. One of the good things about Monument Valley is it’s remoteness. 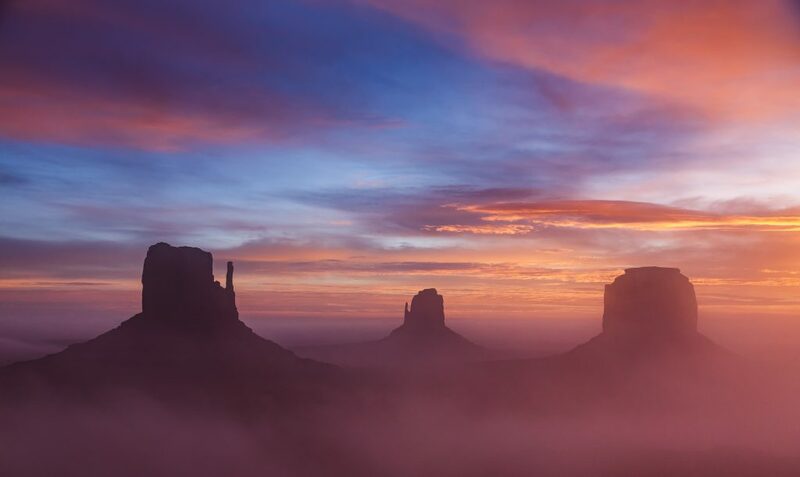 One of the challenges of reaching Monument Valley is the remoteness. It is a nice full day drive from most of the areas larger airports. Albuquerque Sunport (ABQ) is the closest at 186 miles, Sky Harbor Airport (PHX) in Phoenix is 320 miles. Las Vegas International Airport (LAS) is 398 miles, Salt Lake City (SLC) is 383 miles and Denver International Airport is 501 miles away from the tribal park. I would suggest, if time allows, arrive through one airport and return through another airport as there are many other locations that you can visit before or after seeing the beauty of MV. Each of the stops along the 17 mile drive will become a favorite location. John Ford, the Hollywood director who shot many John Wayne films here in MVTP has been memorialized with John Ford Point. You will find that Artists Point, North Window and Three sisters are areas for spectacular views. Aside from the self-drive tour, you can hire a Navajo guide to take you to the Ear of The Wind, The Sand Dunes, Mystery Valley and the remarkable Hunts Mesa., which overlooks the entire MVTP. Although there are horseback rides that you can take, most of the areas to visit are photo-centic. About 25 miles north of MVTP is another very nice area of buttes called the Valley of the Gods. You will also find the Goosenecks of the San Juan about 20 minutes from there. When returning you may want to stop for a cocktail in Mexican Hat. The MVTP is a dry (no alcohol) region. No matter where you fly to and ultimately drive in from, there are many lovely areas to visit while exploring the Colorado plateau. 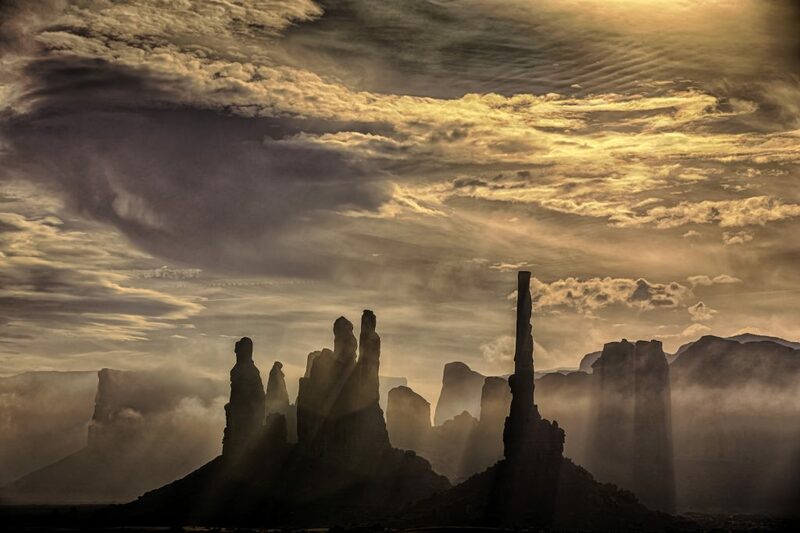 Just 90 miles away is the town of Page, Az. Where you can visit Antelope Canyon, where the water has eroded the sandstone and created lovely slot canyons. On the outskirts of town is a spectacular overlook of Horseshoe Bend. Just up the road from Page you will find both Bryce Canyon and Zion National Parks. 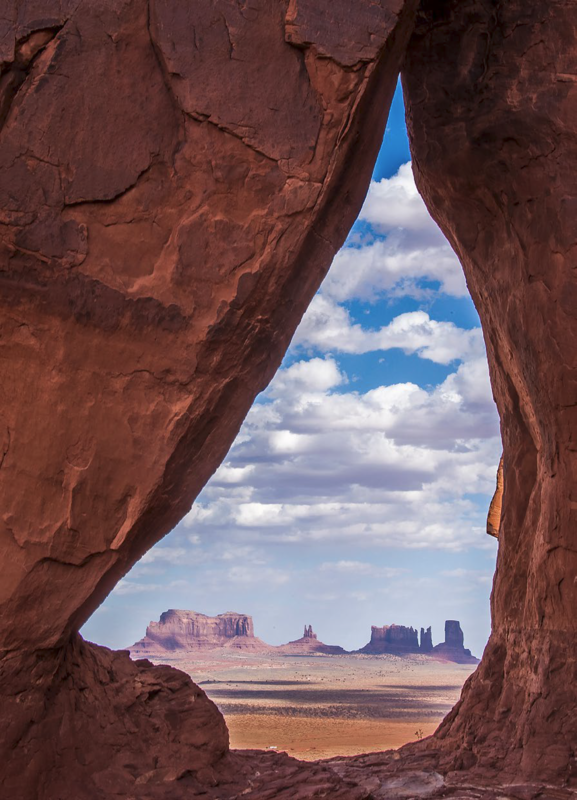 To the north of MVTP is another pair of spectacular National Parks, Arches and Canyonlands. If you are traveling south to Phoenix, you may want to consider visits to the Grand Canyon and Sedona in the red rock country of northern Az. 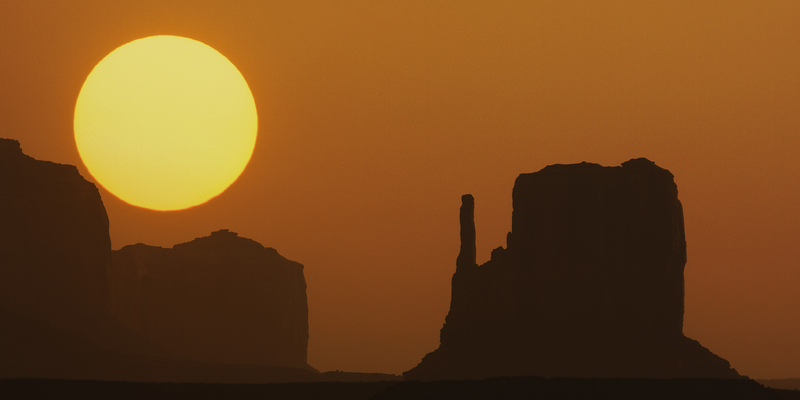 The best advice that I can offer you is to be sure to get plenty of rest before you journey to Monument Valley. You will want to be out and about all day and into the night to see this spectacle in different light and weather conditions. Just please; do not blame me when you fall in love with Monument Valley. Ken Sklute began his photographic career capturing 200 mph race cars in New York at an early age. 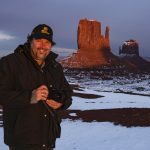 He soon moved into the wedding and portrait industry but chose to relocate to Phoenix, Arizona in 1996 in order to be out photographing the beautiful desert southwest landscape. 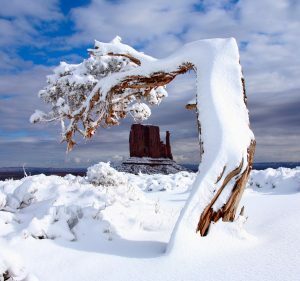 Ken, I too love to visit Monument Valley and your photos have inspired me to go back again this winter and get some snow scenes. I live in southern AZ so its not too far for me either. I stayed at the campground several months ago just as it was cooling off and the sunrise and sunset were wonderful. I was surprise at how much foreground variety is available just off the Wildcat Trail. Thanks for a great review and photos. Two years in a row now, I have turned a cross country drive into a memorable time. This last Aug/Sept, I spent 27 days out on the road Canon 5DII in hand shooting MV and the wonderful array of national parks throughout the area. Reading your story made me miss it all that much more. Thanks. Enjoyed the article and the pictures have given me more ambition to try and capture pieces of art like yours. Absolutely enjoyed these. Great article! This article gave a lot of insight to the area from someone who obviously knows and loves this part of the country. Two years ago I completed a lifelong dream of riding my motorcycle through Monument Valley, Four Corners and the wonderful parks in eastern Utah, having seen the vista’s of MV in many John Ford movies. Stayed in Mexican Hat and at the Goosenecks campground, went over the Mokie Dugway and around the Four Corners area. Hope to make it back next year to Hunt’s Mesa (but not on a bike this time). Thank you RRS for sponsoring a forum for such educational and well written articles. If what you are looking for are the iconic shots featured in almost every western, then Monument Valley is the place to go. My problem with MVTP is the general inability to get closer to the monuments without a guide. So, if you want to get closer to the sandstone and shale formations seen in MV, and I do mean close up, like standing at the foot and looking straight up the side, consider driving a little further north to Valley of the Gods. A BLM tract, the monuments may not be quite as big but standing 30 feet from the base of one, you won’t be able to tell the difference, and, you will enjoy considerably more solitude. Spent 3 days there last spring and saw 10 cars. There is a 17 mile gravel/dirt road that most family cars should be able to handle, unless it just recently rained. Go slow, go easy. Stop where you want and get out and walk, anywhere you like. You can be there for sunrise, moonrise, whenever. Drive around a corner and shoot the same formation from a completely different perspective. Have a full tank of gas, plenty of water and food, since you are going to be self sufficient. Most who drive the road seem to do so counter-clock wise. So, give yourself an extra day when you visit MVTP. The photos you will have may not be the iconic shots from MV, but then they won’t be like anyone else’s. BTW, Mexican Hat is a good place to stay, decent lodging and a couple of good restaurants..